Welcome back for FIREHAWK WEEK! 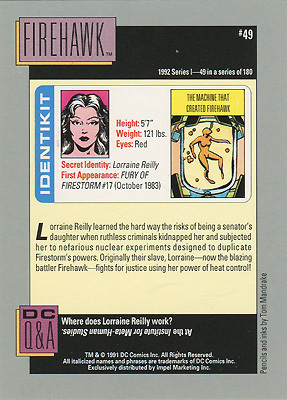 On Monday we looked at Firehawk’s various Who’s Who appearances. Today we’ll be looking at a few other items featuring Firehawk. Don’t forget, come back on Friday for the unveiling of a newly-commissioned Firehawk sketch done for the FIRESTORM FAN site! 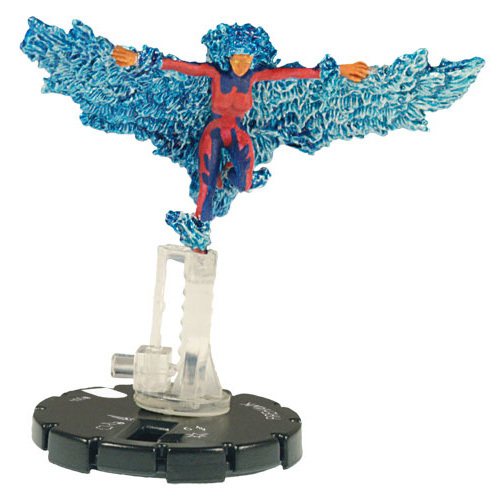 Here is a Firehawk HeroClix game piece from WizKids. HeroClix is a collectible miniatures game in which players construct teams of heroes and villains to play out a battle turn-by-turn on a grid map. Firehawk is #004 from the “Justice League” set produced in 2007, and is considered to be a “common” piece (meaning easy for collectors to obtain). Her rank is “experienced” and the point value for the figure is 63. If all that is meaningless to you, don’t worry. The cool thing is they made a Firehawk game piece and used her current costume (the one she wore when fused with Jason). She looks friggin’ cool! Here is the front and back of the card that came with the Firehawk Heroclix game piece. It provides a brief background on the character, as well as details on the powers her figure has in the game. 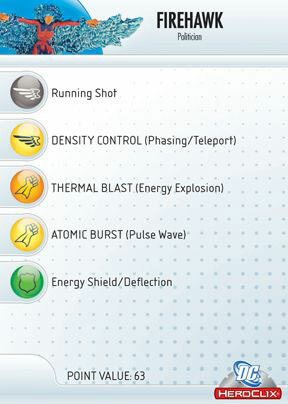 It’s interesting to see how they classified her powers in order to fit their game structure. Next up is the Firehawk card from the “VS System” collectible card game produced by Upper Deck. In the system, players build and play a deck of VS System cards in an attempt to win a game against their opponent. 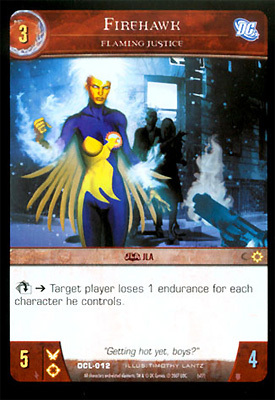 This card is named “Firehawk, Flaming Justice” and is #DCL-012 from the “DC Comic Legends” set produced in 2007. Her attack rating is 5, while her defensive rating is 4. She has a casting cost of 3, and when activated the target player loses 1 endurance for each character he controls. Again, if all that is meaningless, don’t sweat it. Just be happy we got a cool game card featuring Firehawk! I don’t know who the artist was, but they sure did a nice job! This final Firehawk piece comes from the 1991/1992 DC Comics trading card set produced by Impel Marketing. 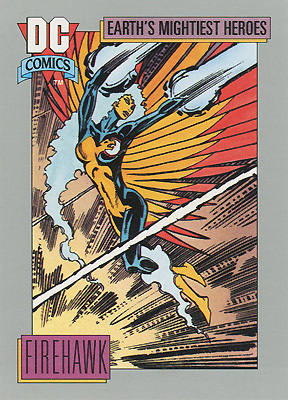 Firehawk is #49 in the series and the art was done by Firestorm (volume II) artist, Tom Mandrake. Man, I love his artwork! He always does such a great job. 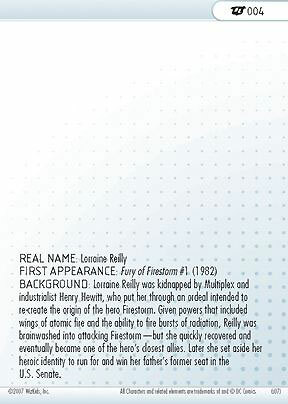 It’s impressive that Firehawk got her own card in this series, especially since the monthly Firestorm book had been canceled a year earlier. That wraps up our coverage today. Come back on Friday when we close out FIREHAWK WEEK! Posted in: Firehawk, Tom Mandrake, Toys, Trading Cards.